After decades as a temperamental light source for industrial use, the high-bay fixture has become a versatile performer thanks to advanced LED technology. You know the type: bright, athletic, resourceful and stylish. They make tough assignments look easy, instantly light up a room and excel at multiple sports. They fit in almost anywhere — and look good out on the town. Before you get too envious, relax — we’re not talking about a rival in the next cubicle. We’re talking about a light fixture: the supremely adaptable LED high-bay. A new twist on an old light, the LED high-bay is taking the center stage of commercial lighting. As their name suggests, high-bay luminaires are designed for spaces with high ceiling heights, usually 20 to 40 feet or more. No doubt you’ve seen them: large thimble-shaped or cup-shaped lights suspended above everything from assembly lines and warehouse aisles to basketball courts and indoor pools. Traditionally, metal halide (MH) high-bays have been a lighting mainstay for industry, manufacturing, warehouses, gymnasiums and aircraft hangars. But MH high-bays are a thorn in the side of finance, operations and maintenance departments. They’re energy hogs, generate a lot of heat, and require replacement every 15,000 to 20,000 hours. The fixtures often emit a loud, annoying buzz as the ballast starts to age, and used lamps must be disposed of according to strict regulations for handling mercury and other heavy metals. The real problem is their impact on productivity: you can’t simply flip a switch to turn MH fixtures off and on. After an MH lamp is turned off or if power is interrupted even briefly, the lamp requires a cooling-off period or it won’t restart. This “restrike” time can last up to 15 minutes, and a MH fixture can take another 15 minutes to reach 90 percent of its full light output. If those fixtures illuminate a manufacturing line or racking systems, every maintenance task means irretrievable downtime. In other settings, that downtime can mean inconvenienced customers and lost sales. 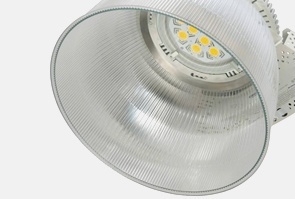 Thanks to the emergence of high-performance LED high-bay fixtures, all that is changing. Even as LED high-bays have become more advanced, they’ve steadily dropped in price. Today’s ultra-efficient LED high-bay can generate energy savings of 65 percent or more while lasting 5-7 times longer than MH lamps. Converting to LED luminaires provides a trifecta: exceptionally rapid payback, a decade or more between productivity-killing work stoppages to replace lamps, and a boost to corporate sustainability mandates. The advantages don’t stop there. The precise optical control afforded by LED light sources means broad area spaces can be uniformly lit with light precisely apportioned down and laterally to best illuminate floor spaces, work surfaces, shelves and racks. In addition, the solid-state nature of LED lighting offers a level of control unmatched by other lighting choices. For all these reasons, industry analysts predict a fast-rising wave of conversions to LED high-bay fixtures over the next five to seven years. The Department of Energy reports that while LED luminaires represented barely 5 percent of the installed high-bays in the U.S. in 2016, their early adopter status will quickly reach the early majority as more and more companies move to capitalize on their advantages. In fact, Navigant Research predicts world­wide sales of LED high-bays for new construction and retrofits will reach nearly $17 billion by the end of 2017. Larger trends are also driving the adoption of LED high-bays across various categories. For example, increasing pressure from online competitors is driving big box retailers to seek better ways to draw customers into their stores and enhance their shopping experience. Better lighting is a key factor in those upgrades. In the manufacturing segment, the emergence of big data and increased automation are spurring facilities to explore LED lighting’s ability to help achieve process improvements and create safer, more productive environments for workers. Many are 24/7 operations. Some are conditioned environments; some are not. Some facilities see temperatures of 130° F or higher near the ceiling; others operate at well below 0° F. Some have canyon-like towers of high racking systems and require ceiling-to-floor illumination; others have relatively low-profile displays and shelves. Some require highly accurate color rendering for detail work or to showcase products. And while some are utilitarian workspaces, others are customer environments requiring luminaires with clean, modern styling. Whatever the combination of factors an application calls for, there’s a high-efficiency LED high-bay to fit the bill. There are LED high-bays delivering better than 150 lumens per watt and are certified for the highest utility rebates. Many come in a range of color temperatures, boast color rendering index scores of 80 or higher, and offer advanced lighting controls for even greater energy savings and a tailored user experience. There are tough-as-nails LED high-bays that shrug off a direct hit from hockey pucks and basketballs and perform flawlessly year after year in temperatures from -40° F to 140° F. In fact, there are LED high-bays that pack all of these features into a single highly versatile and affordable product. By providing exceptional light quality and energy efficiency uninterrupted by costly lamp changes, today’s high-performance LED high-bay luminaire demonstrates that competitive advantage can arrive from an unexpected direction. In categories where low-cost functionality has typically ruled, the right LED high-bay can empower a safer and more productive worker environment with better visibility and controls — or bring aesthetically beautiful light into retail spaces as an integral part of the customer experience. If you’re looking for a better lighting solution, it’s time to raise your sights. The opinions expressed in this piece are solely Cree's. They do not necessarily represent WESCO’s views. 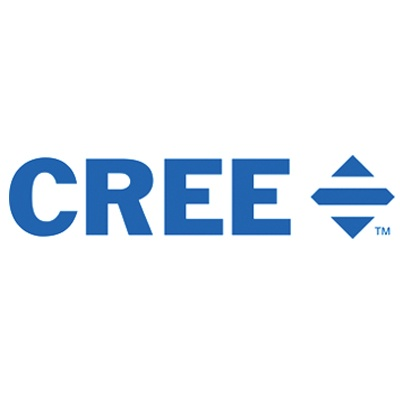 Cree's leadership begins with innovative materials, primarily silicon carbide (SiC), that provide high-efficiency performance for numerous semiconductor applications. Using SiC as a platform material, Cree has spent over 20 years developing an array of new technologies which have established far higher performance standards within a variety of industries. Cree®LED lighting is quality engineered and proven to exceed the demands of the most challenging industrial and warehouse facility spaces.